“Caste haunts you in the food that you eat. It might offer a moment of solace through community support. It might even offer you a god but there are more disadvantages to it”, says Ambai (C.S.Lakshmi) who has translated the Perumal Murugan’s ‘சாதியும் நானும்’ into English. 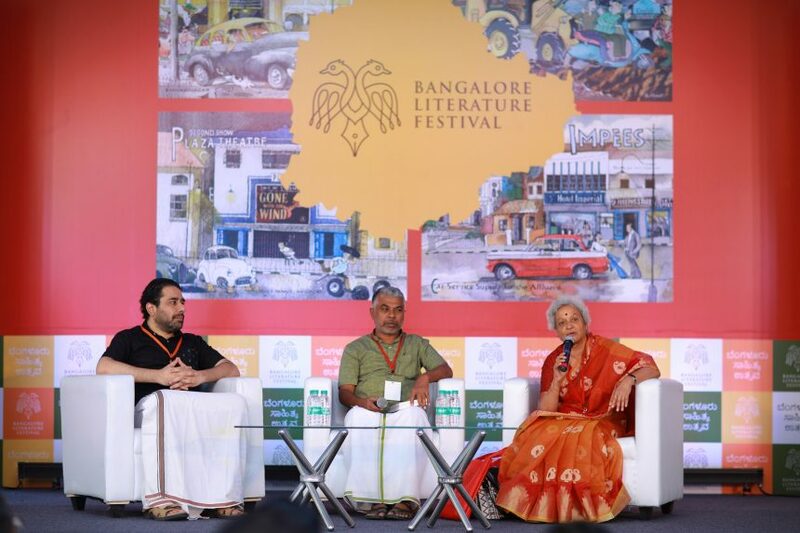 The book is titled, “Caste and I” which was also the subject of discussion of conversation between Ambai, Perumal Murugan and the publisher Kannan Sundaram. The book is an anthology of 32 essays written by people from 20 different castes. The original version in Tamil was released during the 50th meeting of Koodu in Namakkal. The contributors of these articles were not mainstream writers but students and other acquaintances of Perumal Murugan who have either been victims of casteism or have not had the courage to give up on casteism. The articles were personal experiences of these contributors. Ambai talks about the various intriguing tales from the book which affected her greatly. – A young boy from the lower caste who was not allowed to sit in the swirling chair of a salon because the hairdresser was afraid that his customers from upper caste will shun his salon for letting a lower caste boy sit on it. – A dying patient who asked his doctor for his caste. – A student who was mockingly called Rajiv Gandhi by his friends because he was provided with the Rajiv Gandhi scholarship for scheduled caste. – A child from the lower caste who was given black coffee in a coconut shell because the dominant caste believed that serving milk to the lower caste would dry up the cow. Ambai recollects how the courtesy of offering water to a guest when you enter a household in the rural Tamil Nadu was a subtle way of enquiring about her caste. Not just the rural area, even in the urban set up there indeed are people who refuse to rent out houses to Muslims and Dalits, added Murugan. Perumal Murugan while talking about the book and the experiences that affected him says, it wasn’t an easy task to put the book together. People were hesitant to talk openly about caste and how it played out in their lives. But when they spoke about it eventually their worst fears came true. Some of them lost friends and relative severed ties with them. However, there were also good things that came out of it. When a friend from the upper caste wrote about how he could not bring his friends home because his family was against it and how small he felt about it, their friendship only got stronger. Some of them could take off their chest, the pain, humiliation and guilt that they had carried forever, by writing about it. Perumal also talks about two essays that he wrote when his mother passed away. In one of the essays, he talks about his relationship with his mother and how she herself was a casteist. His mother did not approve of his marriage initially since it was an inter-caste marriage but did come to love her daughter in law later. But what shocked him the most was that even when her memory was slipping due to Parkinson’s disease she did not approve of the Dalit girl who was attending to her. Casteism is so deeply ingrained the blood of our people and we continue to pretend as if it does not matter. Ambai has translated these two articles into English and they were published in Sparrow. He also remarks how even today there are different burial grounds and cemetery for different castes in the villages of Tamilnadu and how his mother insisted that he pay taxes to multiple villages to ensure she gets a burial ground. He also humorously adds that when his mother passed away it was the electric cemetery came to his rescue. When people ask him about where he has kept (buried) his mother, he continues to points to his heart.